Are you in love with garlic scapes? Me, too! They are great oven-roasted or grilled, in tossed salad, potato salad, or you can even use them to make pesto. For the uninitiated, scapes are the curly stalks that form a seed head and grow on hardneck garlic varieties. It’s a good idea to remove them to allow all the plant’s energy to form bulbs. Milder than garlic, they are a treat themselves. Scapes couldn’t be easier to ferment. Fermenting them preserves them for later use, and is a great way to add probiotics to your diet. The fermented garlic scapes may used in the same ways you would use them straight from the garden. Keep in mind, though, that cooking them will destroy the probiotics. You may ferment as little or as many scapes as you like. Simply curl the scapes into a circle just smaller than the diameter of your clean fermenting jar, and place inside. Cover the scapes with brine which consists of 3 tablespoons of sea salt to 1 quart of water. Adjust the amount of brine to suit the amount of scapes you’ve harvested. Place a weight on top of the scapes to keep them submerged. You may use a scrubbed rock, a purchased weight for fermentation, or even a plastic bag which contains some water. 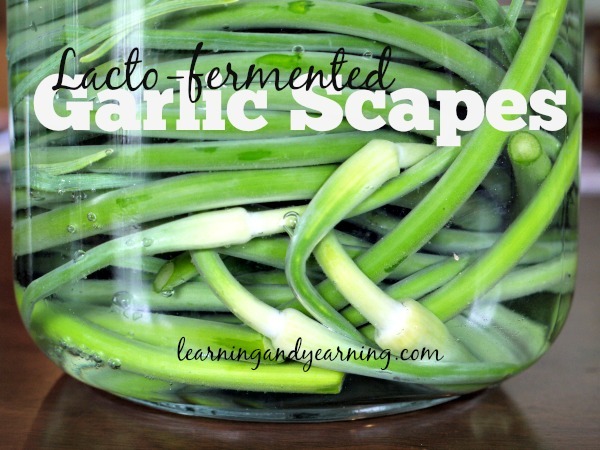 Allow your scapes to ferment for several days at room temperature, and then refrigerate. For more information on fermenting vegetables, see my post Preserving Vegetables Through Fermentation. I keep thinking of adding them to my sauerkraut. I think they would make a good addition. Though I hadn’t though of doing them all by themselves. Oh, great idea, Daphne. The scapes would make a great addition to sauerkraut! Do I need to use sea salt? I have kosher, pickling and regular salt. Thanks for the tips, I will need to give this a try. Hope it taste as good as it looks. I think you’ll love them, Abby! I’ve never lacto-fermented anything, but have done some canning. Do you need a special jar for this or a regular canning jar? Do you cover the jar? I have a bunch that I purchased at the farmers’ market that I wanted to preserve somehow. Hi Amanda, no special jar is needed; a canning jar with lid will work well, but it’s a good idea to loosen the lid once a day to release gases. A lid with an airlock is great because you don’t have to worry about the gases building up. I love to use Fido jars with rubber gaskets. But, again, a canning jar is just fine.